When deciding between different deep sea fishing hooks, there are a few things you need to consider. First, what are you trying to catch or how are you trying to catch them? If you’re out hunting for your white whale, the behemoth blue marlin that has haunted your dreams since the moment you were forced to cut your line, you’re going to want a bigger hook. 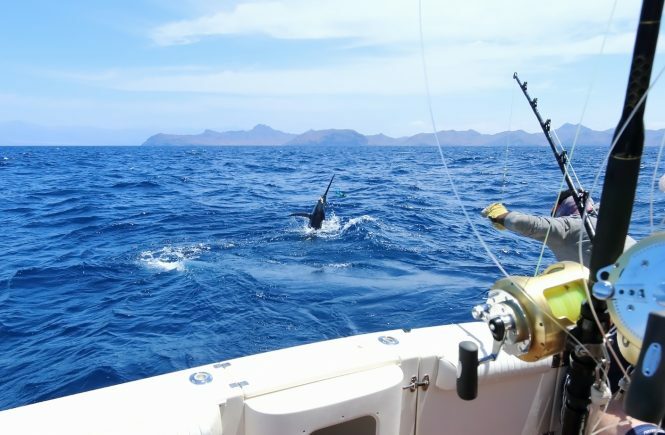 Big seawater fish like marlin require bigger hooks while smaller fish require smaller hooks. 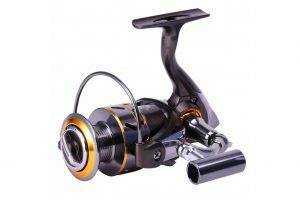 However, size is not the only thing to keep in mind when looking for ideal deep sea fishing hooks, you are going to also need to keep in mind what kind of bait you want to use and what kind of hook would be best to hold it. Before we go any further let’s establish what to look for in a hook. A fishing hook is made up of five major components: the point, the bend and the shank, the eye, and the hook gap. The point is the most self-explanatory aspect of the hook but tends to be the most important as it is what will actually do the majority of the work when you snag a fish. 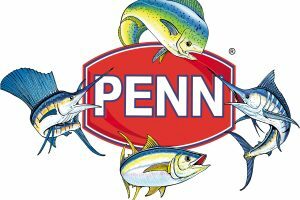 The longer the point, the more time it will take to penetrate the lip of the fish. The longer the point, the more time it will take to penetrate the lip of the fish. Some fish, like that elusive marlin, will require this longer point because of the larger size bait you will need to snare larger fish. The bend and the shank are what makes up the rest of the hook. You need to make sure that a shank’s weight matches the line weight or the hook won’t sink properly. Depending on the kind of hook you’re using, the hook may have less torque or bend while others will bend more easily. The eye is the hole at the top of the hook that you feed the fishing line through. 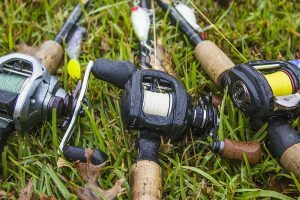 Different kinds of eyes will require different types of knots, which will change depending on what kind of line and bait you will be using. The gap is probably the second most vital aspect of the hook. If the gap between the shank and the point is too small it won’t grab hold of the fish as quickly or effectively. Try and have the widest gap possible, most hooks can be bent up to 10 degrees to help widen the gap. As mentioned before the size of deep sea fishing hooks will depend on what kind of bait you will be using. Smaller sized hooks are generally used leeches and smaller worms (or “crawlers”), medium-sized hooks for larger crawlers and big hooks for minnows and larger fish. Expert fishermen try to use a little bit of a larger hook than the bait requires as the increased size of the gap will increase the likelihood of hooking a fish. Shaped like a “J,” these deep sea fishing hooks have a straight shank that will drive the point into a fish’s mouth when it bites down. 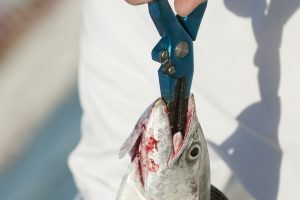 These hooks require the fisherman to pull upward on the hook once they feel a bite in order to set it in place in the fish’s mouth. These are the most common type of hooks and the ones you should be using if you’re fishing with live or dead bait. Their design makes it easy to actually hook the fish, especially if the line is moving. If you’re trolling through the water, these hooks are definitely the way to go. The one downside is that you need to make sure you’re using the right size for the fish you’re attempting to catch. If they are too large or too small for the fish you’ve hooked, there’s a chance they can either get lodged somewhere or swallowed which might result in the fish’s death. The points on circle hooks curve more inward than they do on J-hooks. They’re designed to roll into the corner of the fishes mouth after they’ve seized the bait. This way the fish will essentially hook itself once it bites down. You don’t have to pull upward on circle hooks to actually hook the fish, the design will take care of that for you. For this reason, there is a much lower mortality rate when using circle hooks and many believe them to be a more humane and safer way to fish. One drawback, though, is it’s easier for a fish to avoid getting hooked this way without the jerk upwards to dig the hook into its mouth so it can be a riskier proposition. These hooks are three pronged, with three points branching from a single shank. The advantage to treble hooks is they increase the chance that a fish will be hooked no matter what direction the fish comes from. 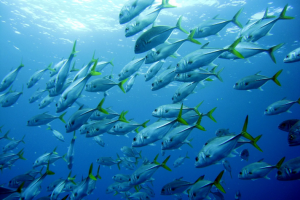 With a single point, a fish can attack the bait from behind and avoid getting hooked. This is harder to pull off with a treble. However, treble hooks present just as many problems as they attempt to solve. Because there are three points instead of one, the pressure is more divided than when using a traditional hook. 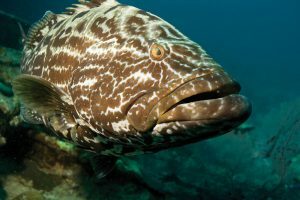 If a fish is only caught on one of the hooks and begins to struggle, you won’t be able to pull with the same velocity as you would if it had been snagged with a single hook. Now that you have a basic understanding of the different kinds of deep sea fishing hooks available to you, you should be well on your way. 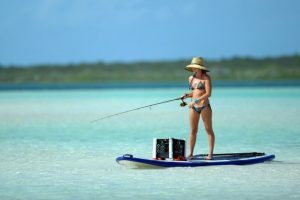 Remember though, you must consider more than just the hooks and the bait when you’re fishing, there are a number of different reels, lines, and lures you should also get familiar. 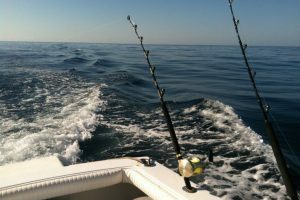 Deep sea fishing can also be some of the most perilous so make sure you also know what mistakes to avoid before setting out to sea. Make sure you do your homework and then you should be good to go! That marlin is out there somewhere, it’s high time you catch it. 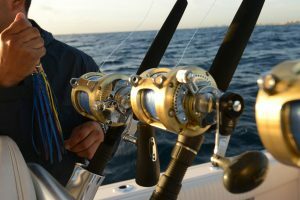 For more information on fishing and extensive product reviews, visit Reel Salt Water Fishing today.